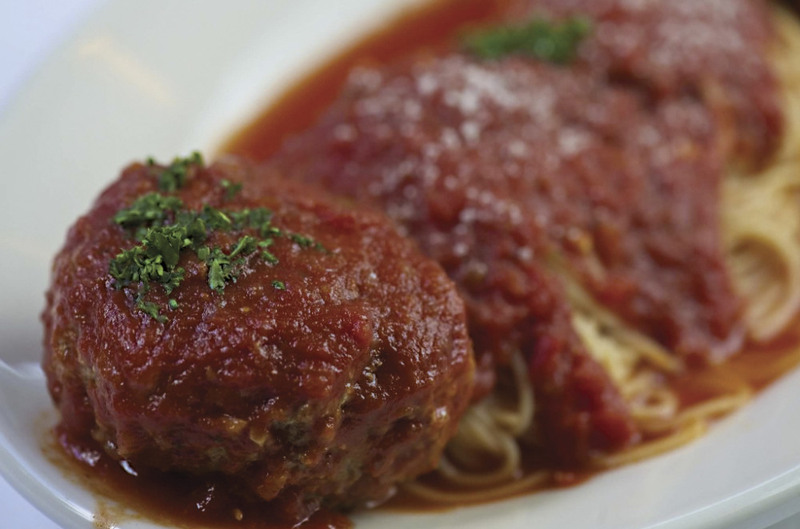 Though there are quite a few new incarnations, there are also plenty of classic Italian restaurants in New Orleans that serve an incredible meatball. One that immediately jumps to mind is served at Pascal's Manale. Open for over a century, this old-school eatery on the corner of Dryades and Napoleon is mostly known for its original BBQ shrimp made with oleo and tons of pepper. 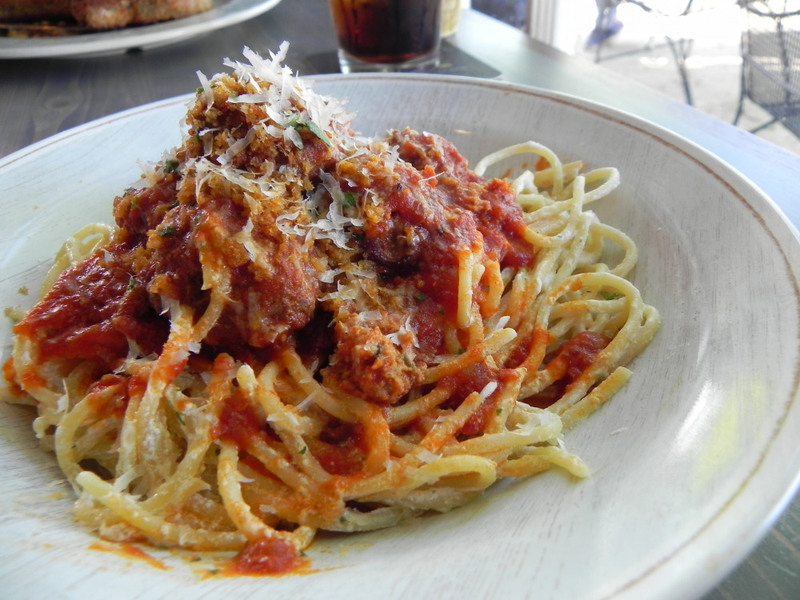 But it would be a mistake to ignore their classic Creole-Italian cuisine, especially their meatballs. For the past 60 years or so, Pascal's Manale has lovingly mastered the art of handmade meatballs created with ground chuck, Leidenheimer French bread soaked in milk, fresh thyme and basil, and romano cheese. 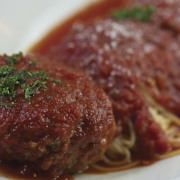 The meatballs are served with pasta and smothered in the restaurant's signature red sauce. At a little under $20 a plate, these blissful balls might set you back a pretty penny, but you'll be devouring a little taste of history with every bite. On the complete opposite end of the spectrum (and on the other side of town) is local chef Susan Spicer's latest triumph, Rosedale Restaurant. Located on the edge of Mid-City and Lakeview, this brand new, casual restaurant once housed the 3rd District police station but has been renovated to include both indoor and outdoor seating while retaining elements—like bars on the windows—that belonged to the original building. In an effort to offer a family-style atmosphere, many of the dishes at Rosedale reflect that down-home feel, like shrimp hush puppies, turtle soup, panéed pork chops and, of course, lamb meatballs. 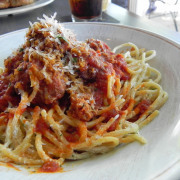 Approximately the size of a golf ball, these tender, flavorful meatballs are cooked in spicy, Calabrian breadcrumbs, served on a bed of spaghetti tossed in ricotta, and then everything is sprinkled with finely shaved Parmesan. At $15, you could add a side of garlic bread, made with pecorino cheese and Leidenheimer French bread, for only $3 more and still keep your budget intact. It may not be casual and it's a giant leap from inexpensive, but once in a while, you simply have to bite the bullet, don your fanciest frock, and give one of our many fine-dining establishments a try. If you're careful, you can still keep to your budget while enjoying excellent service and an elegant atmosphere at a dining destination like Emeril's Delmonico. For example, just because it's a starter doesn't mean there isn't a hefty amount of food in their Louisiana wild boar meatballs. Served in pairs (ahem), these tennis ball-sized mammoths are served with a veggie-rich eggplant caponata, toasted almonds, and garnished with a thick shaving of pecorino romano cheese. Pair these balls of meaty magic with a side of baked macaroni and cheese or roasted cauliflower, and your meal is not only complete, it won't stretch your resources. For something a bit different but no less delightful, head on over to Freret Street for a pizza you will not regret. Owners Steve Watson and Ben Sherman opened Midway Pizza over five years ago and, with devoted diners from the neighborhood and all over the city, it has become a great success. Their popularity can be attributed to a focus on fresh, local ingredients and signature New Orleans deep-dish pies. 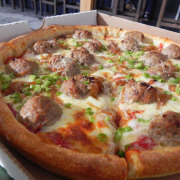 Though several of their pizzas feature handmade meatballs as a topping, a big seller would have to be “The Kingpin.” Named after the owner's Uptown dive bar, The Kingpin is a deep-dish dream with its tangy red sauce, caramelized onions, green onions, shaved Parmesan and golf ball-sized meatballs that remind you of Mama's famous meatloaf. 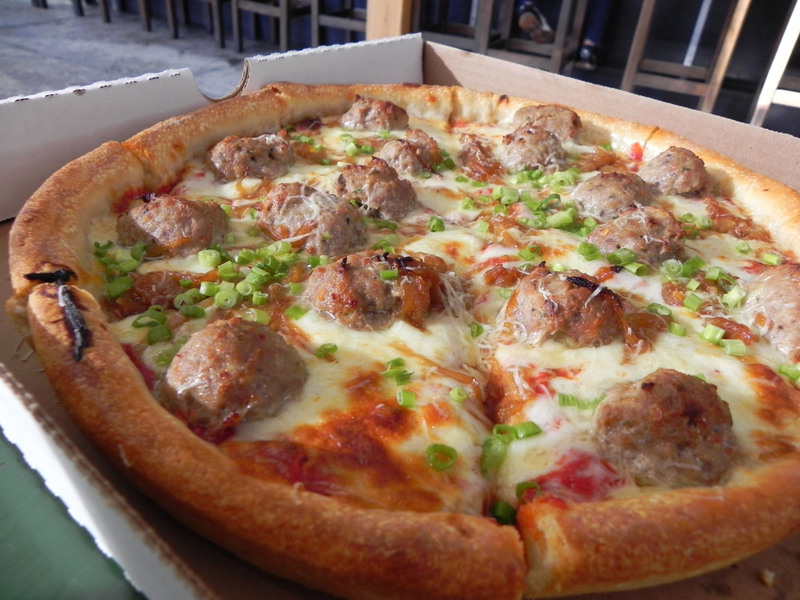 For a 10-inch pie, The Kingpin will set you back $13.50 and is more than enough to feed two people. You should probably consider adding one of Midway's fresh, fabulous salads to your order, you know, just to round out your meal. To totally finish off your meatball experience, you can do no better than to take a little road trip out to New Orleans East and visit Dong Phuong Bakery, located near the far end of Chef Menteur Highway. Among a huge selection of Vietnamese and Chinese breads, pastries and pies, you'll discover a lengthy menu of banh mi. For about $4, you can score a Chinese meatball banh mi (or Xiu Mai) made on the bakery's famous bread and garnished with their own aioli, pickled carrots, daikon, jalapenos, cilantro and crisp cucumbers. At such a great price, you might as well have two or three sandwiches and treat yourself to a dessert of cream buns, steamed banana cakes with coconut sauce or a mung bean pie. After all, you didn't drive out all that way just for a nibble.